← VX murder in Kuala Lumpur? Last September Amnesty International (AI) issued a 105-page report entitled Scorched Earth, Poisoned Air alleging the use of chemical weapons (CW) among other atrocities committed by Sudanese forces in the Darfur region. The chemical warfare section contains numerous images of civilian victims with horrifying skin lesions. It suggests that these are the consequence of exposure to a vesicant, possibly a mustard agent. The report is accompanied by a 4-minute video on YouTube. Several press articles and contributions to on-line media after the report’s publication have reinforced the allegation of mustard agent use. To AI’s great frustration some countries have expressed reservations about the allegations, and so has the Organisation for the Prohibition of Chemical Weapons (OPCW). The non-governmental expert community on CW matters has remained silent. After the initial buzz of interest in the press, the ripples caused by the investigation have all but faded. No fresh chemical warfare allegations seem to have surfaced since the report’s publication. Were the reservations warranted? This posting reviews the report. The AI report documents several atrocities allegedly committed by Sudanese government forces against civilians in Jebel Marra, an area east of the town of Zalingei in south-west Sudan. Zalingei is the state capital of Central Darfur State. For decades famine and war have ravaged Darfur, causing immense human suffering and displacing millions. Humanitarian concerns about people living in camps set up by the United Nations or in the most squalid conditions in remote villages are immense. Access to Jebel Marra is as good as impossible, meaning that the plight of the local population and war crimes remain under-reported. According to AI, even the United Nations–African Union Mission in Darfur (UNAMID) cannot access the region. Amnesty International interviewed 56 residents of Jebel Marra, 46 civilians and ten members of SLA/AW, who alleged that Sudanese government forces utilized “poisonous smoke” during attacks in Jebel Marra between January and September 2016. These individuals, all of whom are either survivors of the alleged attacks or cared for survivors and victims, provided Amnesty International with substantial testimonial and photographic evidence in support of the allegations. The evidence strongly suggests that Sudanese government forces repeatedly used chemical weapons during attacks in Jebel Marra. Survivors and caregivers described a wide variety of ailments that victims of alleged chemical weapons attacks experienced during the hours and days after exposure to the alleged chemical weapons agents. Based on testimony from caregivers and survivors, Amnesty International estimates that between 200 and 250 people may have died as a result of exposure to the chemical weapons agents, with many – or most – being children. The vast majority of survivors of the suspected chemical weapons attacks have had no access to adequate medical care. Amnesty International documented alleged chemical weapons attacks in and around at least 32 villages in Jebel Marra between January and September 2016. Several of the villages were attacked multiple times. The earliest attacks occurred during the start of the government’s offensive in mid-January. The attacks are ongoing. The most recent attack recorded by Amnesty occurred on 9 September 2016. Exact identification of the specific chemical agents allegedly used in the attacks documented in this report would require the collection of environmental samples and physiological samples from those directly or indirectly exposed to the alleged chemical agents. An identification would also require an analysis of weapon remnants used during the attacks. Given that access to Jebel Mara is severely restricted, it was not possible for Amnesty International to obtain such samples. Amnesty International asked two chemical weapons experts to independently review the clinical signs and symptoms revealed by the photographic and video evidence and interview notes. They are both respected experts with experience in unconventional munitions, including biological and chemical warfare agents, and are experienced in the diagnosis of exposure to chemical weapons agents. Both experts found that there was credible evidence to strongly suggest that chemical weapons agents were used in the attacks documented in this report. 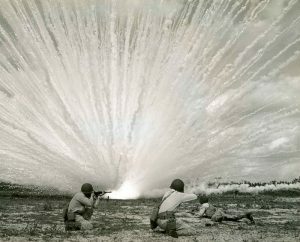 Both experts concluded the clinical signs and symptoms were most consistent with exposure to a class of chemical warfare agents called vesicants or blister agents, which include lewisite, sulphur mustard and nitrogen mustard. 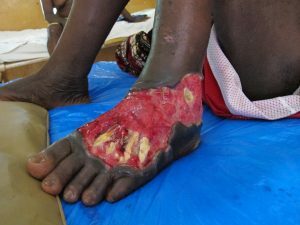 However, they also asserted that it was possible that survivors were exposed to a combination of chemicals in addition to blister agents. These claims the report elaborates in chapter 6 (pp. 69–94), which includes numerous pictures of the effects of the alleged warfare agents on the victims and transcriptions of interview notes. Supporting evidence comes essentially in three forms: witness narratives, pictures, and expert assessment. AI collected statements from three categories of witnesses: caregivers, civilian victims and members of Sudan Liberation Army/Abdul Wahid (SLA/AW). It conducted most of its interviews pertaining to the chemical warfare allegations between June and September 2016. Five statements were recorded earlier: one in April and four in May. The earlier assertions thus appear to have been registered while investigating other atrocities such as the deliberate targeting of refugees and local civilians. They likely prompted AI to expand its probe so as to include possible chemical warfare. Survivors and caregivers reported a variety of changes to skin [Sic]. The changes included severe blisters, rashes, and itchiness. The victims’ skin reportedly hardened, changed colour to white, black, or green, and subsequently fell off. Changes to the skin often occurred very soon after exposure, normally within an hour; however, many caregivers reported that changes to the skin occurred the following day. If the agent were to have been a vesicant, as is often suggested in the AI report, then some time frames are short. While passages such as this one each represent a single interviewee, the AI report does not lay out any individual case studies detailing the evolution of symptoms. Even when allowing for the difficulties in collecting testimonials, two other methodological issues also affect the quality of the claims. First, as the quote above illustrates, many sentences are not written out in full. Combined they do not leave the impression of having been transcribed from a recorded interview; they rather seem handwritten notes transposed into sentences. As a consequence the reader has no inkling how the interviewer pursued his questions, whether and when he followed up replies with additional questions to collect more detail, or if he attempted to corroborate, correlate or disambiguate individual witness accounts. This inevitably opens AI’s estimates of the number of CW incidents and fatalities to critical questioning. Amnesty International’s investigation was carried out by two researchers with extensive contact networks inside Jebel Marra, one of whom is from the area and fluent in Fur, the main local language’. Amnesty International interviewed the survivors and witnesses individually. Interviews generally lasted between 30 and 120 minutes. The majority of the interviews were conducted in Fur, a minority were conducted in Arabic, and a few were conducted in English. Fur is unlikely to contain specific chemical warfare vocabulary. The report does not reveal who translated the interview notes: the interviewer himself or a specialised translator? Since the report does not list the questions put to witnesses, it is not possible to assess how the interviewer communicated his questions on chemical warfare. Similarly, the reader has no sense whether and how he assisted witnesses when they did not fully comprehend a question. Finally, the reader also lacks insight into possible interpretation bias by the questioner and what steps were undertaken to avoid it from occurring as much as possible. I noted earlier that the bulk of interviews concerning CW use took place in the later stages of the investigation. So, at what point in the project and how did AI become convinced that Sudanese government forces had resorted to mustard agent or another vesicant? Were chemical warfare experts already at this stage involved in this assessment? At what point in the investigation did AI begin to receive pictures suggesting possible exposure to chemical warfare gents? The latter question is of particular importance to know how the pictures in the report correlate in time and place with the narrative or individual testimonials. Nineteen graphic colour pictures support the allegations of CW use. Several images show circular wounds; each one surrounded by a mound. 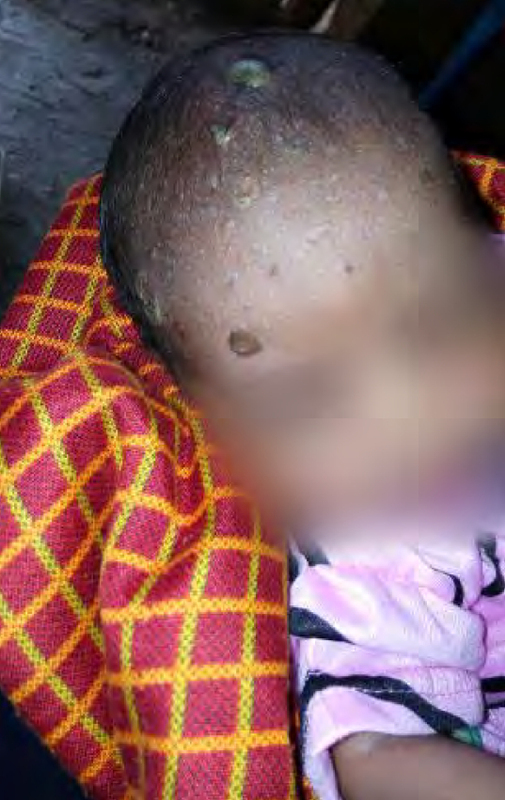 Other ones show babies with blackened skin and larger areas with pinkish mottling. Several portray blackened bodies with large areas of sloughed off skin or a variety of irregularly shaped, ulcerating wounds. Interestingly, they all depict infants and children and no adults. Furthermore, there are no images of fatalities or general scenes showing sites of attacks. The report also contains two pictures of remnants of supposedly chemical agent delivery systems (p. 83). The captions to each of the pictures are suggestive of vesicant exposure. However, not a single one states unequivocally that mustard or a similar agent caused the injuries. They are replete with qualifiers such as ‘might’, ‘consistent with …, [but] atypical in some ways …’, ‘might have been caused by exposure to other chemicals or combination of chemicals’, ‘would appear to be’, etc. Notwithstanding, the common theme is that the individuals were exposed to either blistering, corrosive or otherwise toxic chemicals. When first seeing the pictures my immediate impression was that the injuries are inconsistent with mustard agent exposure. The lesions are discrete and in most instances separated by unharmed skin; the injuries too regularly circular; and the surrounding mounds atypical. Mustard agent usually affects contiguous, irregular patches of the skin. 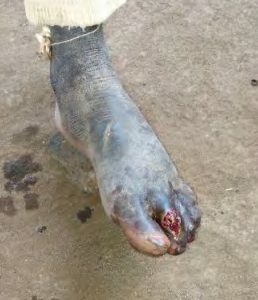 Areas of necrotising skin surrounding the open blisters are also typical. Depending on the healing process scar tissue or discoloured skin would eventually cover the affected areas. 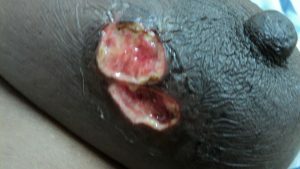 Given the poor sanitary conditions and absence of medically trained staff (the report refers to ‘caregivers’ rather than nurses or doctors), I would have expected some pictures of infected injuries from vesicant exposure. Treatment of such wounds is complicated and healing takes a long time. 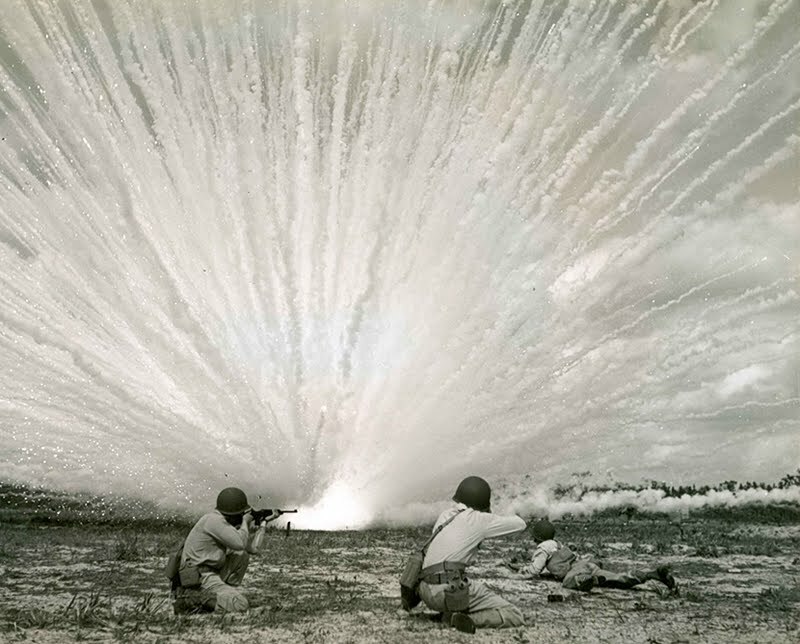 Medical accounts from earlier wars describe the difficult battle against post-exposure infection and the burden this places on medical resources. Impression, of course, is not proof of the contrary. 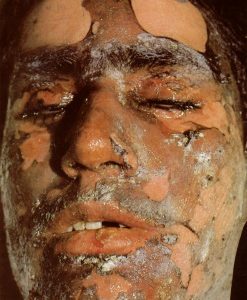 Searching the Internet for images of vesicant exposure, I came across the picture on the left, which as it turned out shows a cowpox eruption. I was struck by circular form of the lesions, the reddening of skin around them and the untouched spaces in between. When I subsequently showed the AI pictures to my wife, formerly a paediatric nurse in a university hospital, her immediate response was smallpox. She revised her opinion to possible chickenpox after I telling her that the photographs are recent. 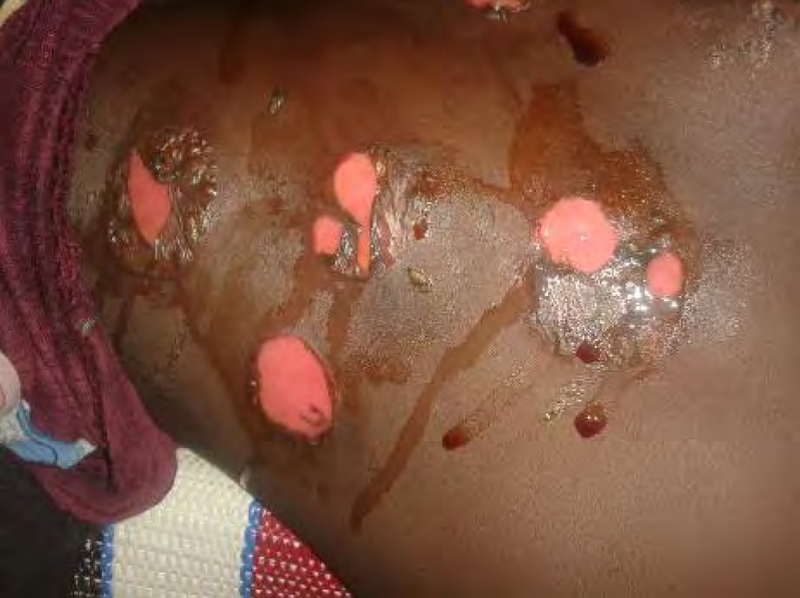 The picture of chickenpox eruption shows not only ulceration but also some blistering. Some other people with a medical background too suggested viral infection of the skin after having seen the images in the AI report. Further searches using combinations of terms such as ‘infection’, ‘blistering’ or ‘ulceration’ yielded two other—this time bacterial—sources of infection producing outward symptoms not unlike those described in the AI report, namely Impetigo and Buruli Ulcer. Impetigo is one of the most common skin infections in children, but can also affect adults. It is caused by streptococcus or staphylococcus bacteria entering the body through irritated or broken skin. It can manifest itself after burns or cuts (not uncommon under war conditions). Ulcers can have a greenish colouring (see pictures below). According to an on-line information sheet by the Mayo Clinic, a less common form of the disorder, called bullous impetigo, may feature larger blisters (picture) that occur on the trunk of infants and young children. The liquid-filled blisters are produced by the Exfoliative toxins of Staphylococcus aureus. Impetigo is highly contagious and can easily spread to other parts of the body (e.g., after scratching itching ulcers) or to other persons, particularly if they are crowded together in unsanitary conditions. 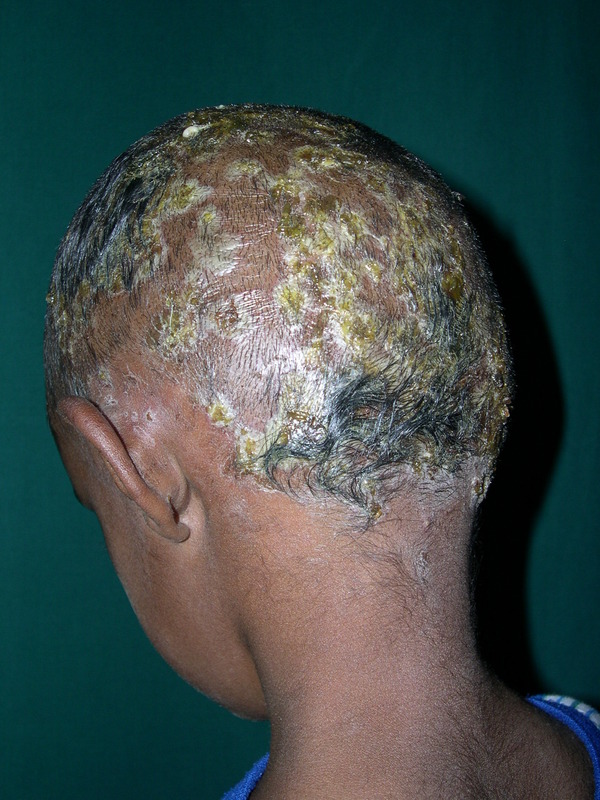 Greenish colouring associated with impetigo ulcers. 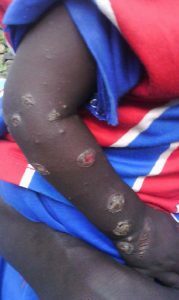 Buruli ulcer, is the third most common mycobacteriosis of humans worldwide, after tuberculosis and leprosy. Buruli ulcer is a neglected, devastating, necrotizing disease, sometimes producing massive, disfiguring ulcers, with huge social impact. Buruli ulcer occurs predominantly in impoverished, humid, tropical, rural areas of Africa, where the incidence has been increasing, surpassing tuberculosis and leprosy in some regions. 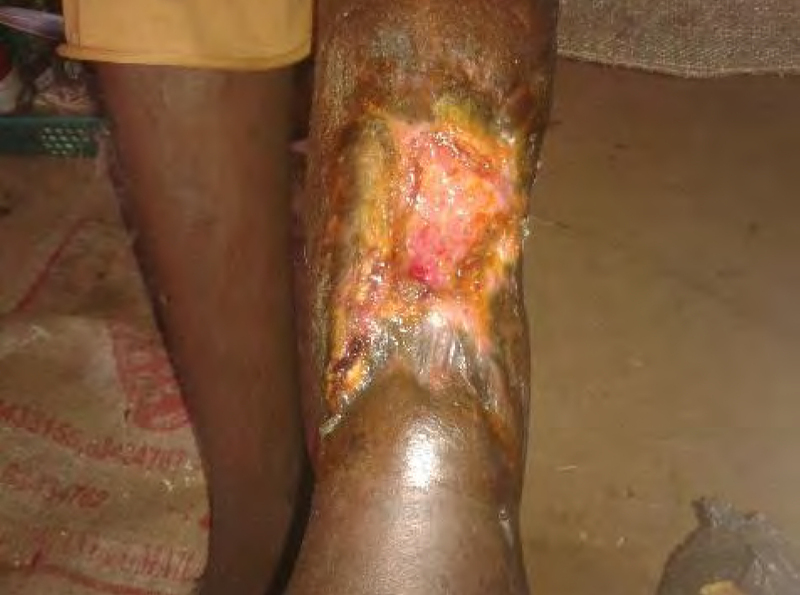 Besides being a disease of the poor, Buruli ulcer is a poverty-promoting chronic infectious disease. I am not claiming that the AI investigators observed cases of infection by either Impetigo or Buruli ulcers. I am not a medical doctor nor am I inclined to pass judgement simply based on pictures. In addition, some aspects of the recorded testimonials cannot be explained by these infections either (e.g., descriptions of pain or narratives suggesting immediate onset of symptoms). However, I do argue that plausible alternative explanations for recorded phenomena exist and that AI did not eliminate them before framing the report conclusions. In addition, I note that both infections affect children in particular, which is of interest in view of the absence of adults in the pictures published by AI, and are indigenous to Sudan. Amnesty International sought the opinion of two external experts to assess the CW allegations. They remain unnamed in the report. However, Dr Keith Ward features in a video released by AI to accompany the report launch. He was formerly a Senior Science Adviser with the FBI and serves since retirement on the Steering Group of the AAAS STEM Volunteers. He advises Amnesty International as well as Human Rights Watch pro bono on questions of chemical warfare. Dr Jennifer Knaack, Assistant Professor of Pharmaceutical Sciences Mercer University, Atlanta, Georgia, appeared in several press interviews after the report’s publication. Both experts independently reviewed the photographs, video footage and interview notes, but had no access to victims or soil samples. They expressed their conviction that the victims had been exposed to toxic chemicals and that clinical signs and symptoms are most consistent with exposure to a toxicant able to produce blisters. They also asserted that it was possible that survivors were exposed to a combination of chemicals in addition to blister agents (p. 5). In section 6.1.2 containing the detail of their evaluations they also allow for exposure to other toxic or corrosive chemicals, especially because not all reported symptoms are consistent with those from vesicants. Without analysis of tissue or soil samples both experts remain circumspect about the precise nature of the toxic agent. Nevertheless, they appear firm in their conclusions about toxic exposure and through their many references to vesicants seem to support the suggestion that such exposure was the consequence of a deliberate act. One expert explicitly links exposure to military operations. Even though the expert assessments are key to the claims of chemical warfare, they take up a mere single page equivalent in the entire report (pp. 71-72). The reader does not know who wrote what. The relevant paragraphs are presented as direct quotes from the experts, but the report does not indicate whether the passages are oral statements, come from a short written note (e.g., e-mail message), or whether more detailed evaluations exist in the form of written reports. There is no information on methodology (except for ‘reviewing the testimonial and visual evidence’), the length of time the experts worked on the evaluation, or at what stage of the investigative project they received access to the evidence. The first cited expert makes a passing reference ‘to extensive discussions with medical doctors familiar with injuries caused by exposure to chemical and biological warfare agents’. Again the reader remains in the dark about the identity, affiliation or qualifications of those medical doctors, or how the evidence and questions were put to them. Indeed, why did AI not approach those experts directly in an effort to collect a wider body of opinion on the allegations? As it stands now, the outcome of those consultations appears one of elimination rather than direct confirmation: ‘the wounds of these victims are not due simply to the effects of conventional explosive or incendiary weapons of war’. In and of itself a mere detail, were it not that the report’s author, Jonathan Loeb highlighted it in an opinion piece published online by the Bulletin of the Atomic Scientists on 17 January to underscore the validity of the conclusions. 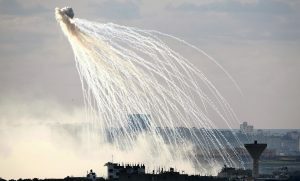 Many of the survivors told Amnesty International that the bombs which delivered the alleged chemical weapons agents exploded upon contact with the ground and subsequently released a thick cloud of smoke. Many of the survivors reported that the bomb which delivered the alleged chemical weapons agents exploded in mid-air, that the explosion was usually preceded by a bright flame or a flash of light, and that after the bomb exploded, it released a cloud of smoke or dust which proceeded to spread out over a large area and descend towards the ground. 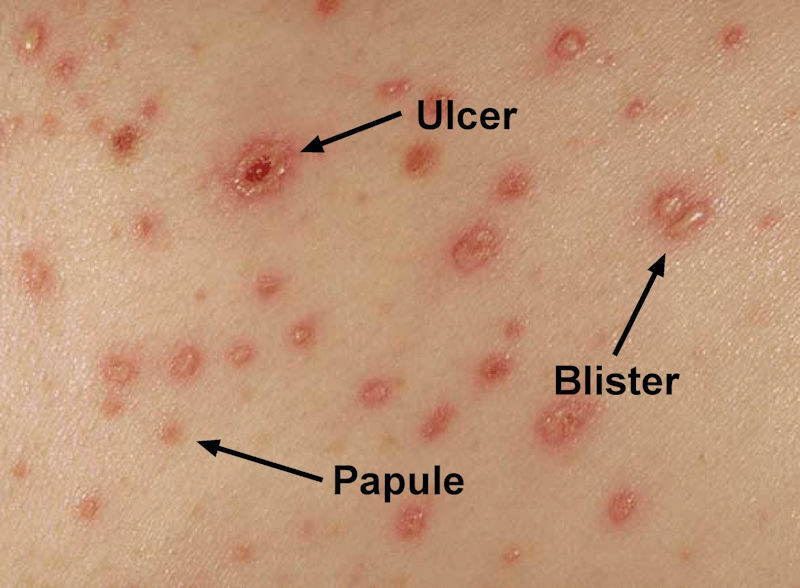 The frequently seen pattern of scattered individual circular lesions also suggests either spatter from hot liquid (which could also be responsible for the extensive skin denudation in some areas with marked sparing of other areas) or else an infectious process. Amnesty International interviewed 57 residents of Jebel Marra, 47 civilians and ten members of SLA/AW, who alleged that Sudanese government forces utilized “poisonous smoke” during attacks in Jebel Marra between January and September 2016. These individuals provided Amnesty International with substantial testimonial and photographic evidence in support of the allegations. The evidence collected from the attacks was broadly consistent and strongly suggests that Sudanese government forces repeatedly used chemical weapons during attacks in Jebel Marra. The residents included survivors and people who care for survivors and victims. Several of the survivors were also caregivers. Many of the survivors witnessed multiple attacks. Based on testimony from caregivers and survivors, Amnesty International estimates that between 200 and 250 people may have died as a result of exposure to the chemical weapons agents, with many – or most – being children. Caregivers also provided Amnesty with what they observed to be the proximate cause of death. Amnesty International documented 32 suspected chemical weapons attacks in Jebel Marra between January and September 2016. The earliest attacks occurred during the start of the government’s offensive in mid-January; the last attack Amnesty documented occurred on 9 September. The report does not include a table offering an overview of the 32 suspected CW attacks and their dates and locations (in as far as such would have been possible, but even partial, if inconclusive data might have been useful). None of the published pictures are dated or associated with a location. Or to push the matter to the extreme: in the absence of validation by external experts, what evidence does the reader receive indicating that AI has proof that the pictures were actually taken in the 9-month time interval of reported attacks? Scorched Earth, Poisoned Air illustrates the difficulties of collecting and validating data that may point to chemical warfare. ‘Truth’ does not exist; it is constructed. The Technical Secretariat of the OPCW employs highly trained inspectors who meticulously follow investigative protocols approved by the states parties. It has access to top-notch chemists from a worldwide network of laboratories regularly certified by the OPCW to the highest possible analytical standards. If it still cannot factually prove CW use in the eyes of some states parties, then the question becomes how a non-governmental organisation (NGO) should collect data and present its findings. This posting has looked in detail at how AI constructed its allegation. It has revealed several methodological weaknesses that directly affect the credibility of the claim. They include lack of rigidity in data acquisiton, validation and consolidation; no discussion of analytical methods applied; no clear effort at eliminating plausible alternative explanations; and the limited role of independent expertise in validating data. Inability to directly access the Jebel Marra area has obviously had some impact on how raw data were collected, but the listed flaws bear on the handling and interpretation of the indicants that were available to the researchers. Taken together, the weaknesses leave me with a feeling that the claims of mustard agent use have been badly oversold. This assessment does not mean that no toxic chemicals may have been used on the battlefield, or that no atrocities took place over the past year. It simply means that an opportunity to prompt the international community to look deeper into the allegation may have been lost.